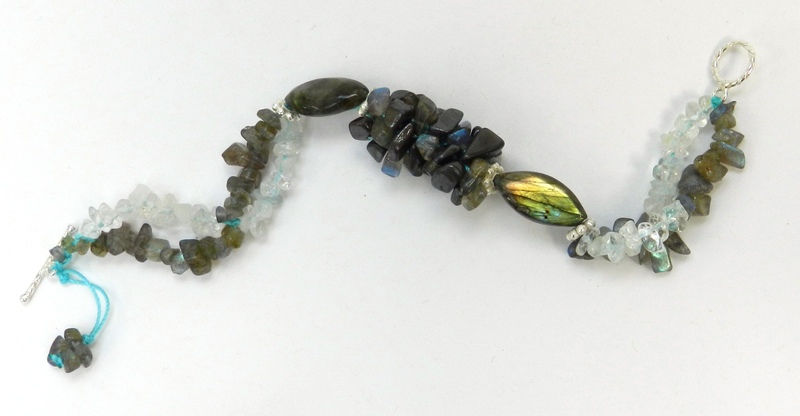 The turquoise and labradorite necklace was demonstrated on 20.7.14 and the show can be found here. Although these instructions refer to the items in the kit I was given to work with, other beads, chains and chips will work just as well. This kit included so much that it was hard to do it all justice. The real stars of the collection were 5 large labradorite marquise-shaped beads and a 1m length of sterling silver and natural turquoise rosary beads. 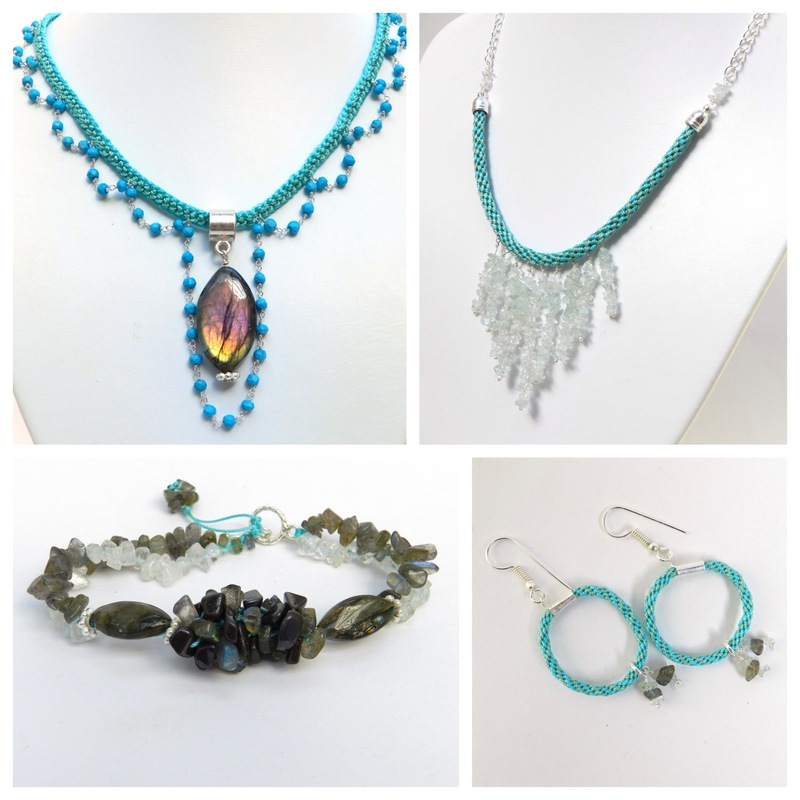 To go with them I was given chips and nuggets of hematite, aqua marine and white topaz. 1. Cut 8 x 1m mint S-Lon and 8 x 1m turquoise S-Lon. Position the cords in the slots on either side of the dots, two cords per slot. Mint in slots 8, 16, 17 and 25. Turquoise in the other slots. Braid in Half Round Braid for 1-2 cm. Instructions for this braid can be found here. 2. To add the chain, when the cords are moved from slot 8 to 16, move only one cord into slot 16. Bring the other cord through to the back of the disk, thread it through the end of the chain and then thread it back through to the front and into slot 16. 3. Braid for 8 complete sequences of moves. Bring one cord through to the back on move 8-16, allow 8 turquoise beads for the loop of chain and thread the cord though the next wrapped loop and back through the one after it. Bring it back to the front and into slot 16. Repeat 5-7 times, depending on the required length for the necklace. 4. Use a headpin to attach a marquise to a bail to make the focal pendant. Thread it onto the braid by removing each pair of cords from the disk in turn, sliding on the bail and returning the cords to their slot. 5. Allow as many sections of chain for the next loop as necessary to accommodate the pendant. Carry on round for the second half of the necklace. 6. Remove the braid from the disk and bind, glue and trim the ends. Pierce the braid with a decorative headpin, just at the edge of the binding. Make a small coil of wire, just big enough to cover the binding and the end of the braid. Thread the coil onto the headpin and the braid. Add a 4mm bead or attach a crimp cover close to the coil. Form a wrapped loop and attach a clasp. Repeat for the other side. This bracelet is made by threading chips onto two cords and joining them here and there by threading a spacer bead onto both cords. The central section is 8 cord Round Braid with chips on all 8 cords. Use a ribbon end to join the two ends of a length of Round Braid. Bend the part with the hole up using pliers and attach it to an earring finding. Don’t forget to add charms before the ends are joined.